Cleveland All-Breed Training Club offers a positive, comprehensive obedience program for dogs of all ages. CABTC focuses on a positive training experience. CABTC has beginning manner classes that offer AKC Puppy STAR and Canine Good Citizen certification. CABTC also offers all levels of obedience competition classes for all types of dogs. CABTC recognizes how imperative socialization is at an early age. We encourage puppy owners to enter classes as early as 8 weeks of age. Our Foundation Skills Series of classes are designed to establish a solid obedience background from the ground up for puppies 5 months and older. We encourage students new to dog training to start with the Foundation Skills One class. CABTC’s obedience instructors have many years of training experience with a wide variety of dogs. CABTC’s instructors are some of the best in Northeastern Ohio. We have experienced, talented, and skilled instructors. CABTC sponsors regular training seminars to continue our instructor’s education on current methods and ideology of dog training. All of our instructors compete in various AKC venues and some have attained many titles on multiple dogs. Some of our instructors have competed at the highest levels of competition and are nationally ranked. All sessions are 7 weeks long. Dog and handler teams are judged on how closely they match the judge’s mental picture of a theoretically perfect performance as they execute a series of specified exercises. Accuracy and precision are essential, but the natural movement of the handler and the willingness and enjoyment of the dog are very important. 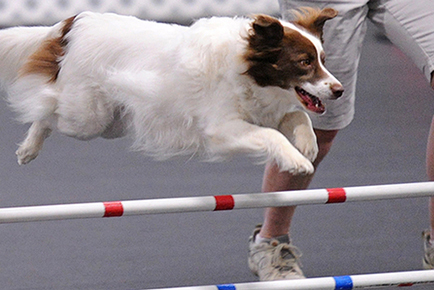 The first AKC licensed obedience trial was held in 1936. 200 dogs were entered in 18 trials in that inaugural year. 3 levels of competition – novice, open, and utility – requires mastering a specific skill set, which increase in difficulty, before advancing to the next level. Novice (CD) – demonstrates good canine companion skills such as heeling, both with and without a leash, coming when called, standing for a simple physical examination, and staying in both a sit and a down position with a group of dogs. Open (CDX) – more challenging, as more exercises are done off leash, and retrieving and jumping challenges are added. Utility (UD) – includes scent discrimination, directed retrieves, jumping and silent signal exercises. Utility Dog Excellent (UDX) when they receive qualifying scores in both Open B and Utility B at 10 separate trials. Obedience Trial Championship (OTCH) title, often referred to as the “PhD” for dogs, is the highest obedience honor a dog can receive.